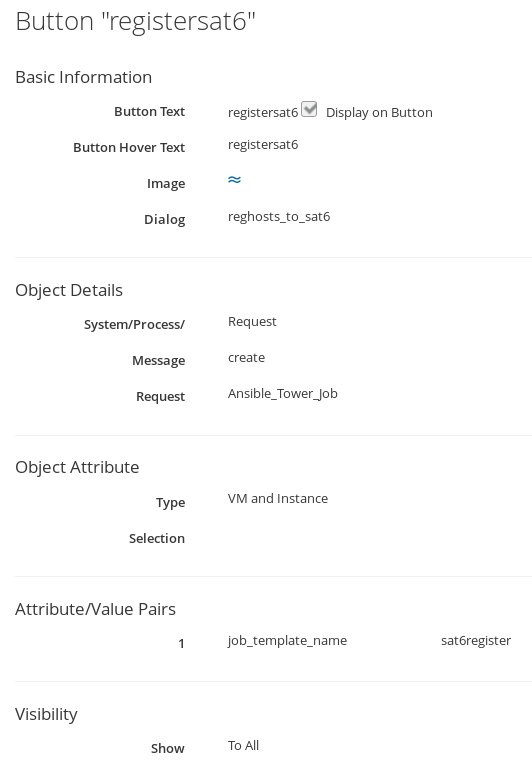 In the first two parts of the blog series you’ve learned how you can create an inventory synchronizing Ansible Tower with CloudForms, create a Job Template in Ansible Tower and auto generate a service catalog item in CloudForms from the Job Template under the configuration management tab. You’ve also learned how you can create a new catalog and add the catalog item to it. Part 3 in the blog series is going to show you how you can create a custom button under the VM instances tab. Step 3 Scroll to your new button group and select it. Once done press add on the bottom right and your done. Press the registersat6 button which will load the sat6register service dialog. In part 2 we create a service dialog which can be ordered from the self service ui. There is one big difference between both dialogs. If you submit the dialog from a button, the Limit (‘hostname’) of the select host is automatically passed as a variable to the CloudForms automate engine. Therefore the limit can be left empty while ordering from a button. This is not the case when ordering from a self service dialog.